I closed the poll for the Halloween discussion last night. It was interesting to see how many churches are doing something at Halloween, and how the increasing popularity of the festival challenges us to think through how to respond in a godly way to our changing culture. Some of us find the whole thing a bit scary, though, it seems. As ever, the most fun and inspiring part of the poll has been the ‘other’ answers. I was very encouraged to find out that people would be praying. Not necessarily so sure about trying to get the Vicar drunk though. And I can’t be the only one who finds the prospect of a Churches Together disco extremely alarming, surely? Saying that we are Christians and celebrate happy things – so come back at Xmas! I enjoyed having another poll up again. Anyone got ideas for another? Wednesdays is my baking day and since the recipe for lemonies seemed to go down pretty well the other week, today I’m going to share another Vicarage favourite bake. I’ve adapted the recipe from one in an Aussie cookbook sent to me by my oldest friend, who now lives in Sydney. Wildwoman is a big foodie and thought I should would enjoy Bill’s food, which I did, very much. This cake has become a staple in our house, where we always seem to have some overripe bananas attracting fruit flies in the corner of the kitchen. Plop everything in your mixer, or a bowl, and mix together. The batter doesn’t need to look too smooth – mine always look pretty lumpy. 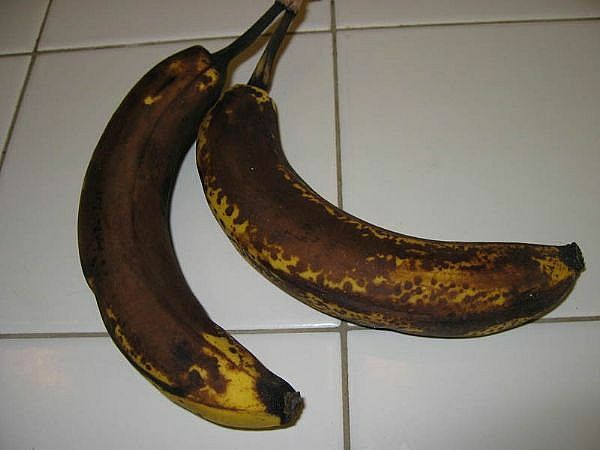 If your bananas are not very ripe at all, you should probably mush them up separately with a fork first. Then pop the mix into a lined (I use a nifty pre-cut reusable silicone liner) 2lb loaf tin. Bake for 1hr-1hr15mins in your oven at 180ºC (Gas 4, Fan 170ºC). When it’s done, it will be firm to the touch and a skewer should come out pretty clean. Leave it to cool in the tin. This cake keeps really well, if you can manage not to eat it. 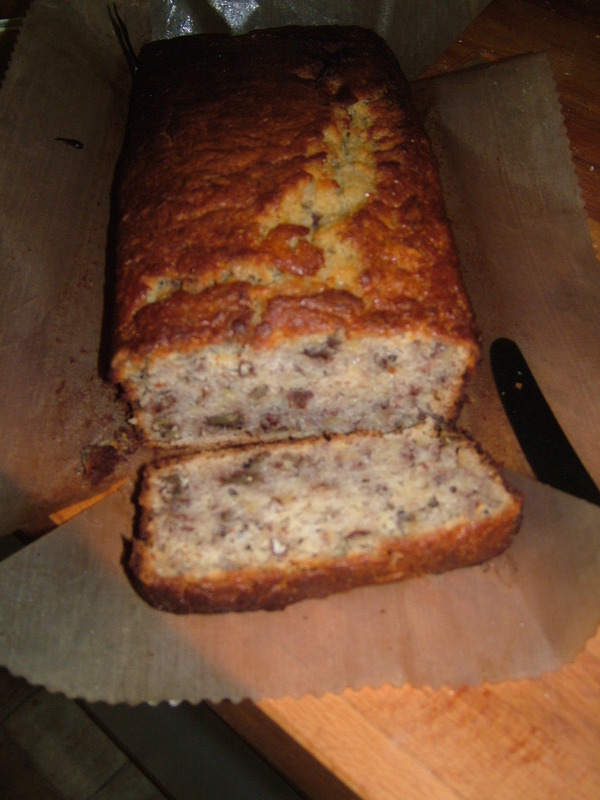 Here’s last week’s Pecan Banana loaf, which was popular with both the family and the gang at Cake and Chat. What do Vicar’s Wives think about as Autumn half term looms and Christmas will be upon us any minute? Summer holidays of course. We need some thoughts of warmth to keep the chill from our bones as we resist switching the central heating on for one more day… and one more day… and one more day. Actually, it’s cheap deals on summer holidays that are the key factor, so we have now booked our Eurotunnel tickets, using the marvellous bargain of quadrupling the value of Tesco Clubcard vouchers. And we have bought a new tent! This is most exciting, as the last one saw us through seven seasons and was finally consigned to the campsite bin as we left for home this summer. The three broken zips, combined with extreme dampness and the world’s largest birdpoo meant that we felt that we’d had our money’s worth and were ready to start again. The special thing about our new tent, besides the increased floorspace that it offers us, is that it is made by a local company, Wynnster, who are part of the Khyam group. Last week we ordered the tent and were able to collect it in person from their warehouse just down the road from our local Ikea. So we were able to combine tent collection with a cheap bonus lunch out. I rather wish the weather was better so we could try it out now, but we are not hardy campers, so we’re waiting until 2011 until the Vicar and I can have a really good argument about how to erect it. Well, that’s made for a great Saturday. The Vicar was outside chatting with a kind neighbour who has been repairing our Victorian garden wall. 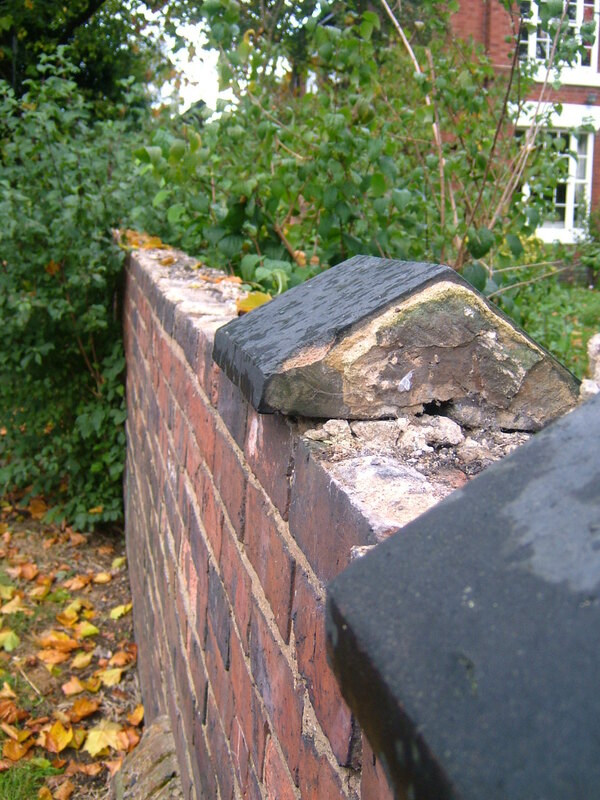 The neighbour remarked that he’d have to get on with putting the coping stones back on the top. He’d seen that the stones had disappeared a couple of days ago and had assumed that the Vicar had taken them off since they were loose. Alas not. Someone has been and taken them! So now about half our wall looks strangely naked. So if anyone offers you a load of cheap Staffordshire blue coping stones, let me know. At £40/m, we reckon they’ve stolen about a thousand pounds worth. When people ask me what my job is these days, I usually say I’m a mother, or a full time clergy wife. And that I’m not paid to do either of these things! And since people like to pop people in pigeonholes, they are sometimes surprised to find out, usually at a much later date, that I used to design systems for mechanical equipment for water and sewage treatment. Sometimes I want to tell people that I was a sh** engineer, but I wasn’t that bad really and also I tend not to swear if I can help it. I can still spot all the sewage works from a train window, though. I quite enjoyed working in the water industry. I spent my UK career with consulting engineers, Mott MacDonald and then worked in Malaysia for the (then) new national wastewater (euphemism for sewage) company, Indah Water. After that, whilst we were still living in the Far East, I worked as a freelancer for Symonds Travers Morgan and French contractor Vivendi Water. Anyway, today I thought I’d tell you a bit of my watery history,because today is Blog Action Day. Now, I’m not normally into memes and group bloggy things, but water is something I know a bit about. Actually, I probably know more about dirty water (another polite word for sewage). But the challenge is that about one in six people in our world don’t have access to clean drinking water. 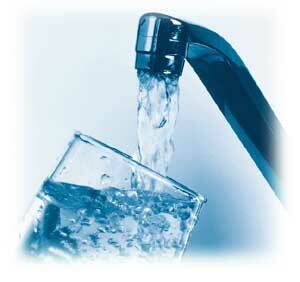 And often the reason that drinking water isn’t clean is because the wastewater hasn’t been cleaned up. And nobody ever thinks about the sewers. Do you know where your local sewage works is? Thought not. So I don’t know what I’m urging you to do, because I looked at the petition on the Blog Action Day site and it was just asking the UN to do something they want to do anyway. And you couldn’t sign unless you had a US zipcode. I don’t really think that will help. But be thankful for your water. Pray for those without. Give to a charity that seeks to supply clean water. WaterAid comes to mind, or Tearfund. Oh, and wash your hands, cos today is also Global Handwashing Day. Recently I was reminded that Halloween is just around the corner (thanks Cassie!) and have been thinking about the different ways that churches and individual Christian families can respond. The idea of celebrating darkness and things of the night goes against the grain with Christians who have been rescued from the dominion of darkness and brought into the kingdom of the Son (Col 1v12-13). In previous years I have attended a ‘Light Up the Night’ walk in Wolverhampton and friends in Wolves have organised a Light Party. Someone else I talked to had organised the young people from their church to go door to door with lanterns giving out sweets and treats rather than asking for them. In our small church, we’re not really at the stage of being able to organise a party or walk, but we always ensure we have a supply of sweeties and Christian tracts to give to the visiting ghouls. The Good Book Company and 10ofthose supply some, although I feel there’s probably a gap in the market for something a little less wordy. I also get the visiting kids to perform a joke or song for their sweeties. In Scotland, where the Vicar grew up, Halloween was a night for guising (it’s mentioned at the bottom of the Wikipedia page) – dressing up and going door to door with a wee show for the residents, for which they would give you a treat. So beware, you’ll need to have practiced if you come to my door at the end of half term. And just the other day I was pointed to a blog post with a devotional based around carving a pumpkin. It’s a lot less weird than it sounds and I think I might try this with my kids this year. So, how will you and your church be responding to Halloween this year? I’d love some extra inspiration. I’ll leave the poll open for a week. Complete? Not yet. But working on it. I had a great day out on Saturday with three ladies from church. We went to the Northern Women’s Convention in Manchester. Things didn’t start brilliantly… I was woken by the doorbell ringing at 7.45am. That was the time I’d asked the women to arrive so we could leave in good time. Oops. Well, once I’d got my act together, we were off and there in time to get a seat. For the first time ever, the conference was sold out, so it was packed with about 1,000 women from around the north of the country. I spotted friends from all over: Leeds, Preston, Sheffield, Chester, Newcastle On Tyne, Wolverhampton and Tipton. It was mentioned from the main stage that the last tickets sold on the Tuesday beforehand. I think they were sold to me! In by the skin of our teeth again. Lizzie Smallwood’s talks from Colossians on The Complete Woman were challenging and encouraging in equal measure as she reminded us to ‘become what you are’ but also to have ‘a good clear out of our behaviour wardrobe’. The Holy Spirit, said Lizzie, is God’s beauty consultant – your very own Gok. Did I mention that Lizzie is a vicar’s wife? Yay! Helen Roseveare is now in her eighties and has been a Christian for over sixty years. And yet her joy and delight in knowing Christ continue to overflow as she speaks, as fresh as if she were a brand new believer. She spoke of how she is continuing to learn and grow in wisdom even at her advanced age. It was wonderful to hear her and be reminded of the privilege that she spoke of – to know Christ and also to suffer for him. I want to be like her when I grow up. I came home and immediately started reading her autobiography, Give me this Mountain, which tells the story of her missionary life, including the five months she spent as a captive of rebels in Congo. This year the talks and seminars from the conference will be available free in audio on the conference website, but the main talks and Helen Roseveare‘s seminar will also be on dvd for just £10 – you need to email the conference office to order. If you didn’t make it to Manchester, I highly recommend getting it. We’re getting a couple of copies to share around folk who weren’t able to come along. Next year’s conference is on Saturday 8th October 2011, and the speaker will be Rebecca Manley Pippert, author of the classic book on evangelism, Out of the Saltshaker. Book early next year – I’m going to!